So I am working 7 days a week for the foreseeable future... But no complaining here. Since Dawn is self-employed, technically, she will not get paid during maternity leave... So I will take all the OT possible before the baby comes. Especially since all the big pre-baby projects are done. Bathroom is remodeled, several rooms painted... Garden started. 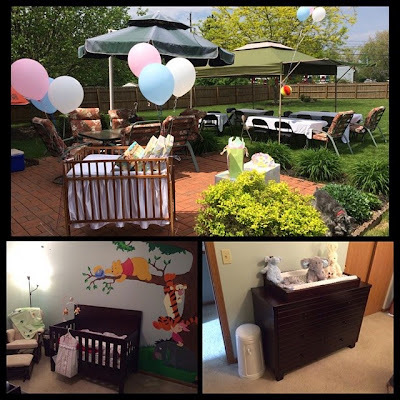 But Thursday and Friday was pretty much non-stop cleaning for the baby shower at our house. Nursery was all put together with what we have so far... which is all the necessities. And since Buckeye can't see very well at all with his cataracts... AND the fact that he is getting pretty old, at almost 14 years old... He doesn't do big groups well and gets pretty scared and stressed. So I brought him to work. He was VERY well behaved, but didn't want to lay down for the first hour. 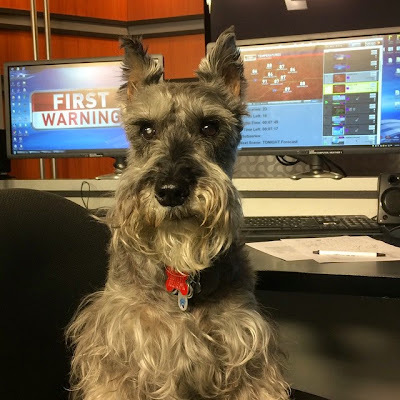 Just kept smelling his way around the weather center. 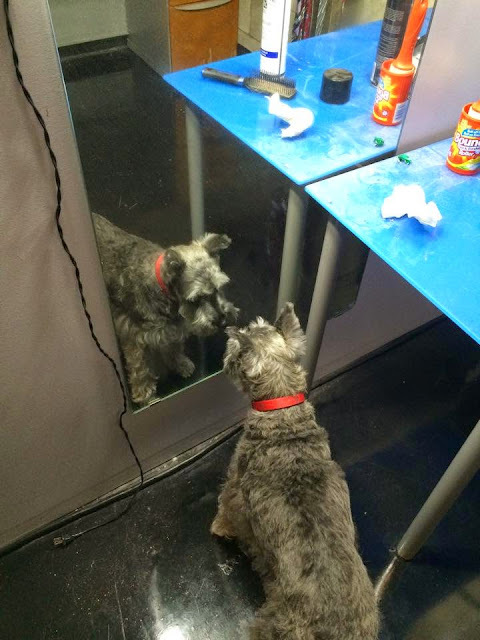 I have never put a mirror in front of him. He can kinda make out shadows and avoid bumping into most objects, but I really think he could see himself in the mirror. He would stare into it for a while then look back up at me. It was really cute. But he went home just before the news and was excited to see me back at home later. 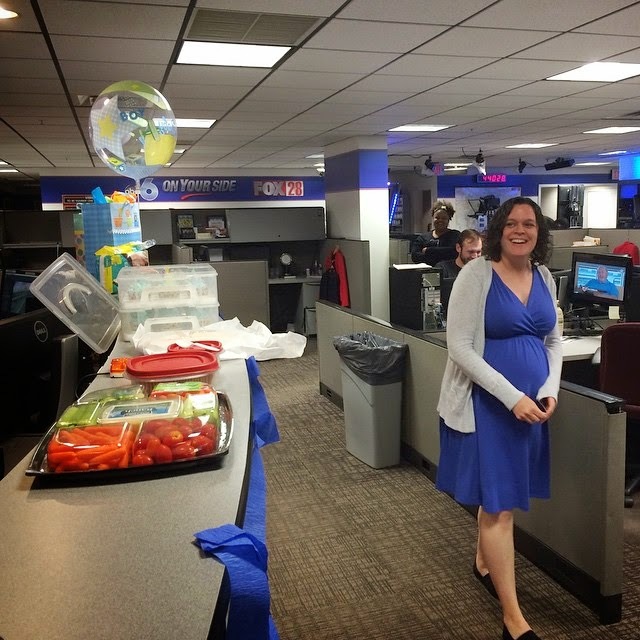 Today we surprised one of our weekend directors, Sam, with a baby shower. She is due one day before Dawn. She had no idea and we got her a little choked up with happy tears. Her and Dawn have been chatting some during the pregnancy journey which is pretty awesome. They have never met, but message on Facebook. What a great sunset tonight! 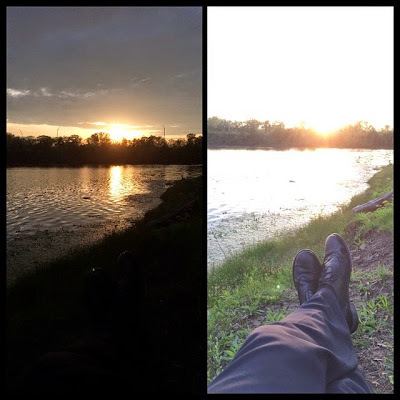 Above is the same photo, but the focus is just changed. 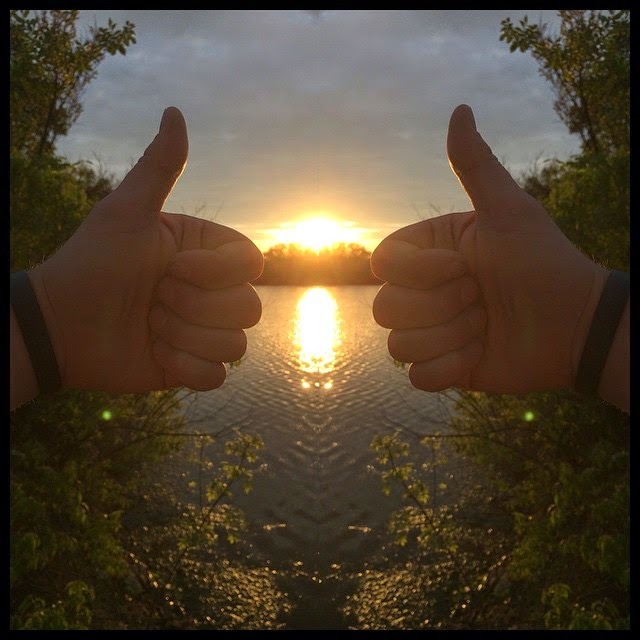 And what a two-thumbs-up of a sunset! So I have been a weather enthusiast all my life. I do not know if I have EVER seen quite an active map as Saturday evening. 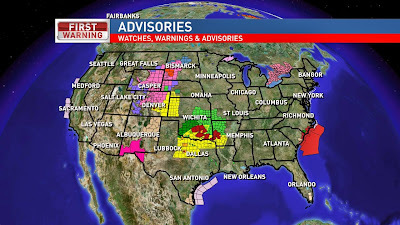 We had a Tornado Warning, Blizzard Warning, Severe Thunderstorm Warning, Flash Flood Warning, Winter Storm Warning, Tropical Storm Warning, High Wind Warning, Red Flag Warning, Dense Fog Advisory... And that's not mentioning the watches and other advisories. INSANE!!! 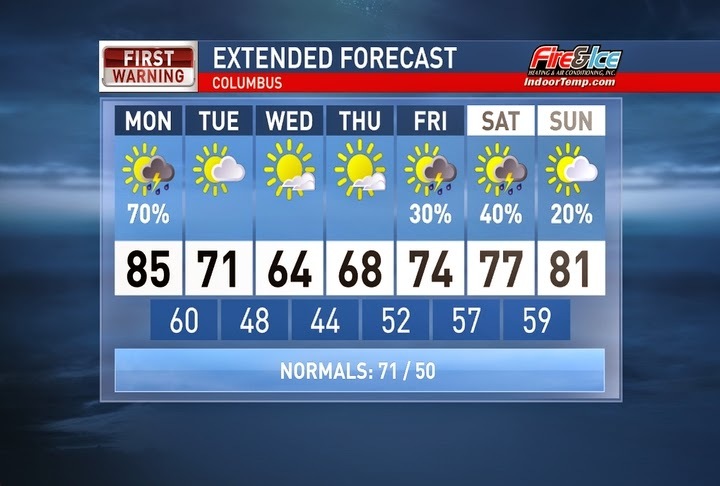 Central Ohio could see some severe storms on Monday. Tomorrow will be warm and humid with highs in the mid 80`s. Best chance for strongest storms will be the afternoon/evening. Tuesday we will dry out and cool off with highs back in the lower 70`s. Wednesday and Thursday look sunny with highs in the 60`s! Have a good one!